Continuing its’ ‘15 in 15’ approach for network expansion, India’s largest luxury car player Mercedes-Benz today inaugurated its world-class dealership in Dehradun. ‘Berkeley Motors’ is Dehradun’s first ever 3S (Sales, Service, Spares) luxury car dealership and promises the famed Mercedes-Benz brand experience to the connoisseurs of luxury motoring in the region. 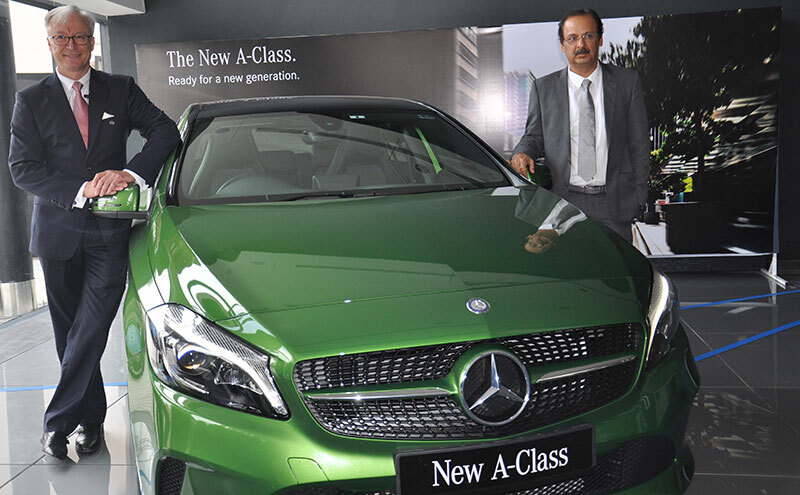 The luxury car dealership was inaugurated by Roland Folger, Managing Director & CEO, Mercedes-Benz India and Ranjeev Dahuja, Managing Director, Berkeley Motors. The state-of-the-art 30,000 sq. ft. Berkeley Motors 3S dealership promises to be Dehradun’s ultimate luxury car destination. Designed and created to provide a fascinating Mercedes-Benz experience for customers, the new facility has optimum visibility and presence in the area and is conveniently located for customers. The world-class Service Center features 6 service bays that will provide patrons a comprehensive luxury ownership experience. The dealership has a qualified and experienced team of 35 committed personnel ensuring a hassle free and unmatched experience for the customers. The dealership is located at Mohabewala Industrial Area, Subhash Nagar Chowk, Saharanpur Road, Near Hotel Softel Plaza, Dehradun. The strategic location of Berkeley Motors Dehradun will also be crucial in targeting the potential customer base in addition to the new set of customers for the luxury brand. We are extremely proud to be trusted partners of the iconic Three Pointed Star in India. Our vision is aligned with Mercedes-Benz’s philosophy of ‘Best or Nothing’ and we are inspired to create customers for life with our services. Dehradun is a unique market with untapped potential for luxury products and services and we see immense potential for this market to grow. At Berkeley Motors, we are committed to provide the best of product and services experience to our discerning customers. There is an increasing demand for Mercedes-Benz products in Dehradun and adjoining markets and we are delighted to see the customer base for Mercedes-Benz growing here. We are confident of delighting our customers with an unparalleled luxury purchase and ownership experience. Pursuing its innovative ‘15 in 15’ network strategy in India, Mercedes-Benz ventured its way in to the beautiful Doon valley of the Himalayas – Dehradun with the inauguration of its 13th outlet – Berkeley Motors, creating a new benchmark in the network expansion drive in the luxury car segment. With the establishment of the new 3S dealership at Dehradun, Mercedes-Benz India continues to have the densest network by any luxury car manufacturer in India, spread across 40 cities and 81 outlets. The company is pursuing a carefully curated network expansion strategy with the objective of moving close to the customers.